Big Blue Bug Pest Solutions has been offering exceptional pest control services to the people of New England including, Groton, CT for over 80 years. Groton is a beautiful place for people and families to call home. Groton’s location on Fishers Island Sound, between the Thames and Mystic Rivers attracts year-round residents, along with many tourists and unfortunately many pests, including insects and rodents. Big Blue Bug Solutions is a local pest control company that understands the local pests and the needs of our local customers. To solve any pest problem in your Groton home or business trust the experts at Big Blue Bug Pest Solutions! Ants, crickets, earwigs, spiders, silverfish, roaches, pantry pests and mice; what do all these creatures have in common? Big Blue Bug Solutions can help to eliminate and prevent all of these pests and more from invading and causing damage in your Groton home! Connecticut homeowners face numerous pest pressures all year long; we understand this and are committed to providing year-round, safe, effective, and fast-acting solutions to any pest problem. Big Blue Bug Solutions offers year-round protection for homes through our Home Owner’s Policy or HOP! HOP includes 3 visits per year from one of our trained and experienced technicians. During visits we will provide preventative treatments and the on-going monitoring of especially vulnerable areas; it also includes the guarantee that if pests come back between visits, so will we at no additional cost to you! The commercial pest control professionals found at Big Blue Bug Solutions are committed to helping business owners in Connecticut keep their facilities free of any and all pests. Whether you own or manage a Quick or full-service restaurant, hotel or motel, food processing facility, distribution center, education facility, or a healthcare facility we can put into place a plan of action to eliminate current pest issues and completely prevent future pest problems! Our monthly maintenance program provides your commercial facility with monitoring services for pest activity, thorough preventative treatments, and the peace of mind knowing that if problems are found, they will be taken care of immediately. We also have the ability to provide more specific treatments for very invasive species like termites and bed bugs through our commercial pest control solutions! To get started protecting your Groton commercial property from the many pests that live in and around Groton, get in touch with Big Blue Bug Solutions today! Bed bugs are an invasive pest species, they are parasitic and unfortunately for the people living in Groton, their favorite and basically only food source is human blood. Bed bugs are tough to eliminate, but not impossible, especially when you seek help from the dedicated bed bug control professionals at Big Blue Bug Solutions! Bed bugs are nocturnal, they only come out at night, making it difficult to know exactly where they are living and hiding in your home. The professionals at Big Blue Bug Solutions understand the ins and outs of bed bugs and can provide the solution to any size bed bug infestation in any home or business. If bed bugs have found their way into your property, contact us today, to get started eliminating these biting pests from your property as quickly as possible! 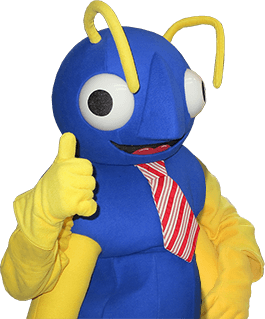 At Big Blue Bug Solutions we are more than just the 58-foot big blue termite that sits on the top of our roof in Providence - although he is at the heart of all our employees! We are a company that has been trusted by our New England customers for over 80 years. Since our very beginning, we have been committed to providing pest control services that were not only effective, but that were environmentally sound. We understand that pest issues in both homes and businesses are serious issues and we are committed to making sure that your property’s pest infestation is completely eliminated through our thorough and highly developed pest control solutions. Give us a call today to learn more about any of our pest control solutions for Groton, CT residential or commercial properties!